1878 March 5 Blantyre Blantyre, LKS Wm Dixon Ltd Thos Murdoch Collier 50 In shafts- overwinding From Main body of report: Six men were killed by one accident. An engineman took the cage, upon which they were ascending, up to the pulley. He appears to have shut off the steam and so far decreased the speed, for the rope did not break, and the cage, although broken, remained attached to it. The six men, however, had either jumped off or slid off the cage, and fell to the bottom. One man remained on, and was removed uninjured. The engineman was tried at the Glasgow Assizes for neglect of duty, but a verdict of " not proven " was returned. 1878 June 3 Leven Wemyss, FIF Fife Coal Co Ltd John Johnstone Sinker -- In shafts  things falling from part way down Knocked off the scaffold by bucket door falling while fixing it. Sinking pit. From Main body of report: Happened to a fireman who, at the time of the accident, it is understood, was examining the mine before allowing the workmen to enter to their work, when he exploded a small quantity of firedamp which had collected in a part of the air-course a little above the ordinary level of the roof. The amount of firedamp was trifling, and the injuries which caused death 12 days after were at the time not considered serious. It was stated that this was the first time firedamp had been discovered in the mine, and that at the time of the explosion the deceased was making his examination with an open light. From Main body of report: The pit at which the irruption took place is 27 fathoms deep, and was suddenly filled to within 12 fathoms of the surface. The old workings, from which the water flowed, are of considerable extent, but have been abandoned for upwards of 50 years. Referring to plan which exhibits the workings of two seams of coal, the first six-feet seam lies at 18 fathoms from the surface, and the lower or nine-feet seam, at 27 fathoms. At the time of the accident the working was confined to the lower seam. The depth of surface overlying the stratified rocks, lying not far above the sea level, averages 54 feet, of which 40 is principally composed of sand. Several dislocations traverse this part of the coalfield, and the fracture, or ''veise'' is generally found filled with sand. In mining up to these fractures, or barring them, there is frequently a partial discharge of water, which is looked upon as quite an ordinary, occurrence. In May last the place marked x on plan, when extended to the dislocation a a, relieved some pent-up water, to check which supports were immediately put to the roof, and a rough darn constructed, backed by a loose building. This had the desired effect of shutting off the water, and the place was supposed to be left in a secure state. Nothing further was done until the 5th of July, when the .manager had occasion to be in or to pass near to the mine x, when he discovered water and sand passing from the front of the dam. On observing this, precautionary measures were taken, which were completed before night. No further discharge was observed up to the time of the disaster, which happened on the afternoon of the following day, 6th, when the water which lay in the six feet seam found its way into the mine x by the "veise" of the dislocation a a. The pressure of the water, probably equal to 100 feet or thereby, forced away the , obstruction at X , and made an opening down the veise of the dislocation 25 feet and 4' X 10', in which it must have rushed with considerable force. The bottomer, who was employed at the bottom, was so suddenly overtaken that he did not escape, and two of the miners, working at B, the dipmost part of the mine were, I presume, instantly closed in, their bodies being afterwards found near to their working-place. Fortunately the work was nearly over for the day, and five workman, engaged at different parts of the mine escaped by the" blind " pit. The appliances for pumping, the water and unwatering the mine were kept in constant operation, but the bottom was not reached until the 2nd of September when the body of the bottomer was found, and nearly four weeks elapsed before the bodies of the others were reached. The works were conducted or guided by an old plan, which is now found to be in error at least 46 fathoms, or rather the workings have been extended 46 fathoms beyond the limit shown upon the plan. 1878 July 15 Standhill, Limestone Mine Bathgate, Linlithgow James Russell & Sons A Haslin Miner -- Fall of Roof & Sides Fall of roof at face. 1878 July 20 Wester Gartshore Kirkintilloch J & A Wallace Robert Gray Sinker 23 Explosions of fire-damp Explosion of fire damp. From Main body of report: Happened at a shaft in the act of being sunk as an outlet for one adjoining. No 1, the first, reached the "main" coal at a depth of 54 fathoms. The workings in it are yet of a preparatory kind, the principal one being a mine driven towards and under the shaft No. 3 in the act of being sunk, and which eventually will form the course of communication between them. At the time of the accident the sinking pit had reached 37 fathoms from the surface. It appears that at a depth of 16 fathoms a bore-hole was: put down to the mine in the main coal off No. 1 pit, for the purpose of drawing the water off No. 3, and to the bottom of No. 1, where arrangements were made for pumping it. In prosecuting the sinking of No. 3 pit, feeders of firedamp were opened about 30 fathoms from the surface. These feeders have continued to give off gas, more or less, from the time they were first opened. Firedamp also escaped by the bore-hole referred to, if at any time it got choked or the water did not run off freely. The ventilation was maintained in the ordinary way by a midwall,which at the time of the accident reached to within 22 feet of the bottom of the shaft, and a current of air, beyond the natural ventilation, was produced by the occasional use of a jet of steam placed in the upcast division about seven fathoms from the surface. It appears that from the 8th of July the night shift of men worked with safety lamps, but during the day the workmen could carry on their operations without the aid of lamps. Blasting operations were carried on without lights, and the shots were fired by applying heated iron rods to the fuse or match. Dynamite was the explosive in use at the time of the accident. The work was carried on by three shifts of men in the 24 hours, and five men were engaged on each shift. On the day of the accident, 20th July, the afternoon shift commenced at two o'clock, and up to the time of the accident, about six p.m., they had prepared six bore-holes and were making preparations to blast. Two of their number had gone to the surface and by arrangement sent down in the return kettle two hot irons to be used for igniting the fuse attached to each shot. The kettle was lowered properly, and the usual signal was afterwards given from below that they were ready to blast. The engineman acknowledged the signal, and in a few seconds after an explosion took place, which cleared out the midwall in the shaft, and carried away part of the pit-head frame and other woodwork near to the mouth of the pit. 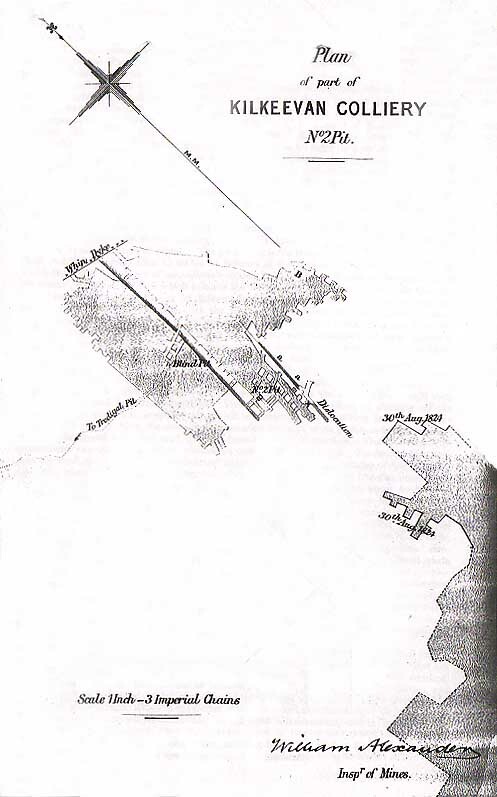 The displacement of the midwall, part of which kept the "barring'' in its place, was followed in less than two hours after by the surface forcing in the "barring," and a mass of earth, &c., probably from 3,000 to 4,000 cubic feet, fell down the shaft, completing the wreck and thoroughly shutting off all communication. As explained, previous to the accident the water passed from the sinking shaft by the bore-hole, but after the accident the bore-hole was closed and machinery had to be erected to pump it. To do this and secure the shaft occupied a considerable time. After access was got to the bottom and the bodies recovered, it was found that of the shot-holes, six in number, which were prepared, three had been exploded, two had been ignited at the fuse, not exploded, and one remained entire, the fuse still showing that it had not been lighted. This unfortunate occurrence appears to have been occasioned by a small accumulation of gas near the bottom of the shaft; and, as it is understood there were no lights in it at the time, the direct cause of explosion is limited either to the ignition of the fuse or the flame from the blast. There is good reason for supposing that none of the shots were exploded till after the accident, therefore the assumption is that the ignition of the fuse caused the explosion of firedamp. I do not suppose that the gas existed in an explosive state from the bottom up, but rather that a little firedamp passing off at the bore-hole was ignited by a fuse, the flame from which extended to the feeders about five fathoms up. By general rule No. 8 of the statute after inflammable gas has been found, and for three months after by sub-section 1, it is provided that "A competent person who shall be appointed for the purpose shall, immediately before firing the shot, examine the place where it is to be used, and the places contiguous thereto, and shall not allow the shot to be fired unless he finds it safe to do so, and a shot shall not be fired except by or under the direction of a competent person who shall be appointed for that purpose." From Main body of report: Happened when 3 workmen were about to be lowered to their work. After going on to the cage in the usual way, it appears that instead of being lowered they were raised to the pulleys, when in some way the cage was stopped, either by the engineman discovering his mistake and checking it, or by the resistance of the crossbars on which the pulleys rested. The deceased, who, I understand, was more alarmed than his companions, on finding the cage being raised, leapt off it on to the plates at the pit mouth, from which he fell into the shaft, and was killed; but those who were with him remained on the cage, and ultimately succeeded in getting off safely. The engineman was charged by the Procurator Fiscal with culpable neglect of duty, was tried by the Sheriff Substitute in Airdrie and a jury, found guilty, and fined twenty pounds, failing payment, imprisonment. 1878 August 22 Gilmilnscroft Auchinleck Gilmour, Wood & Anderson James Baxter Collier 50 Explosions of fire-damp Explosion of fire damp. From Main body of report: Occasioned by the deceased entering, inadvertently, a part of the mine not at the time in course of working or extension, and igniting some firedamp which had collected in it. The injuries he received were thought to be slight, but he died from the effects a few days after. The Procurator Fiscal charged the fireman in this case with failing to observe the 4th general rule, the observance of which was binding upon him by special rule No. 38. The .case was tried before the Sheriff' Substitute in Ayr, when the charge was found not proven. From Main body of report: Occurred at a mid-working, the victim being a bottomer, who at the time was engaged pushing a hutch of coals towards the shaft, for the purpose of putting it on the cage ; in some way he failed to observe that the cage was not in its place to receive it, and the consequence was that the hutch fell down the shaft, he falling with it, a distance of 12 fathoms. There was a door close to the side of the shaft, which the deceased required to open before he could get to the cage, and in opening it he ought to have seen whether the cage was in its place before pushing the hutch forward. This apparently he neglected to do. Certain simple contrivances have been introduced for the prevention of such accidents, the most effective of which when closed acts as a scaffold, and when open as a fence. From Main body of report: Happened to a sinker whilst engaged upon a scaffold about eight fathoms from the bottom of the shaft, through gross mismanagement, in attempting to ungear a crane whilst in motion. 1878 October 2 Stevenston Bothwell, LKS Lesmahagow & Longlee Coal Co David Anderson Collier 20 Falls of Roof At stooping while holing. 1878 December 9 Dunsyston Shotts, LKS Summerlee Iron Co James Nelson Miner 46 In Ironstone mines Struck by a splinter of ironstone flying off face.